This vintage inspired tea room is beautifully decorated with antique furniture. Lena’s is the perfect place to relax and unwind. 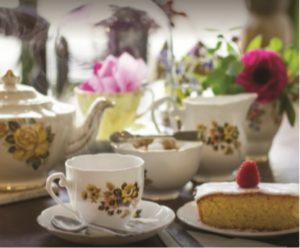 Vintage tea sets are used to serve the perfect cup of tea which is complimented by exceptional home baked delights. They are famous for their award-winning pear and almond scones. Try the amazing chicken sandwich on their homemade milk bread! Gluten free options are available. In 2014, won ‘Today FM’s Best Café in Ireland’.